Our product range includes a wide range of orthopedic hip implant instrument and hip replacement orthopedic instruments. We are the manufacturer of Orthopedic Implant Instrument. 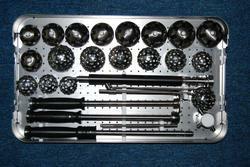 These instruments are used in various hospitals, clinics and other such establishments for various surgical activities. The offered orthopedic instruments are extensively appreciated for their durability, smooth finish and accurate dimensions. We offer a wide range of Orthopedic Instruments that are manufactured using the latest technology. These instruments are made from quality material and have a longer life. These instruments are manufactured using premium quality raw material and cutting-edge technology in conformity with the international standards of quality. Looking for Orthopedic Implant Instruments ?